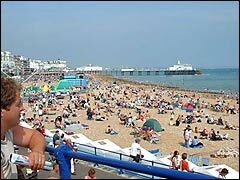 We enjoyed a great day out in gorgeous weather at Eastbourne in East Sussex to visit the free Eastbourne Airbourne airshow event on the seafront, viewing the many dramatic flying displays by military aircraft along with plucky parachutists and wacky wing walkers. 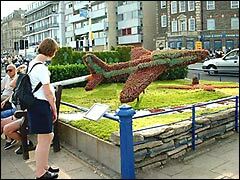 There were more planes, demonstrations and ground displays on the adjacent Wish Tower lawns. 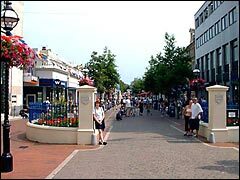 On the way to the seafront for the free airshow we headed down the pedestrianised bit of Terminus Road in downtown Eastbourne. There's a large covered shopping area, the Arndale Centre to the left of this view, but Belinda managed to resist the temptation. 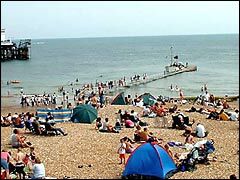 After our rather wet holidays in Cornwall and the Lake District earlier in the summer, it was good to have some hot, sunny weather and have a reason to slap on the sunscreen on Eastbourne's splendid seafront near the pier. Hey, you've missed a bit! 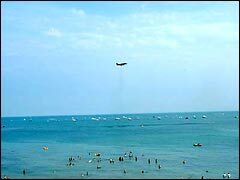 Looking across Eastbourne beach and suddenly the peace was shattered by the thundering roar of a large military plane zooming low above our heads, taking us by surprise; odd considering we knew we were at an airshow - airbourne was underway! 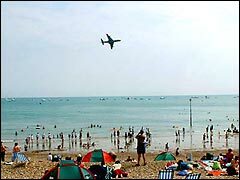 The first aircraft we saw at the Eastbourne airshow was the Nimrod MR2 which flew in, making several low passes over the beach. A version of the Nimrod was supposed to be the UK's airborne early warning system before Awax, but let's not get political. ...here's the Harrier GR7 hovering over the sea, you can see the disturbance the downdraught from the jet engine makes. Bet those swimmers were glad they didn't venture out further! Among other aircraft flying at Airbourne were a Jaguar GR3 and Hawk T1. 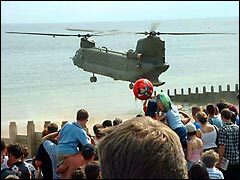 At the Eastbourne Airbourne airshow the chunky Chinnock helicopter landed on the beach, throwing up sand and spray (which they warned you about over the PA). They staged a beach battle, picking up a Land Rover, then a person precariously dangling on a rope. 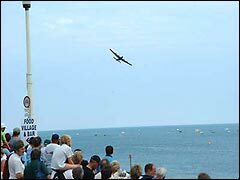 Next the famous Lancaster bomber came flying overhead, accompanied by a Spitfire and Hurricane, all iconic aircraft from WWII, and made various passes at the Eastbourne airshow singularly and in formation with the Battle of Britain Memorial Flight. Here's Mike looking out at the Tornado F3 as it flew past spectacularly showing its afterburners. It was all rather dramatic, with plane after plane flying along in quick succession and was pretty noisy too, but nonetheless enormously enjoyable. On the lawns at Eastbourne's Wish Tower there was the airbourne ground display; here you could sit in the cockpit of a military aircraft as this woman was just about to. 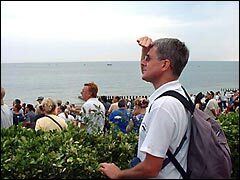 The sheer number of people visiting made taking pictures rather difficult at the airshow. 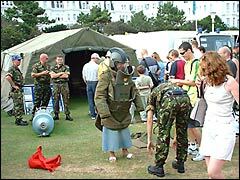 This woman's trying on some combat gear on the Wish Tower lawns, looked on by those rather hunky looking army guys, it almost made Belinda want to sign up for the army! The military man in the foreground is saying 'now try bending over like this'. 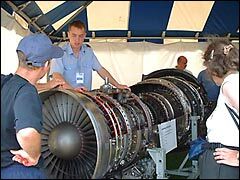 This guy's explaining his job as an aircraft engineer, making the innards of a jet engine sound pretty simple really! Now, that powerful aircraft engine is sure to make Mike's car go faster, do you think they'd miss it? Hmmm, anyone looking? 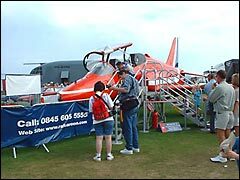 Unfortunately there wasn't a flying display by the Red Arrows at Eastbourne Airbourne this year and we had to make do with this Red Arrow on the ground. As with that other plane, people could climb into the cockpit and have a twiddle with the controls. 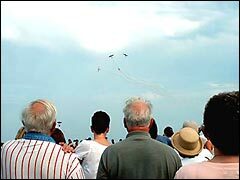 Another formation display flew past over the delighted crowds' heads. Eastbourne airshow was very well organised with hardly any wait between displays; noisy though - and that was just Mike enthusing that he wanted to be a pilot/aircraft engineer/army guy/etc! Here's the two Utterly Butterly female wing walkers doing hairy handstands and walking to the end of the wing. 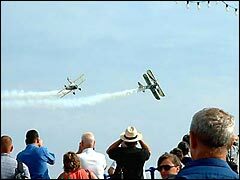 These biplanes flew upside down, at each other, trailing smoke and so on, all at 60 mph - gulp, hope they had a change of knickers back at base! 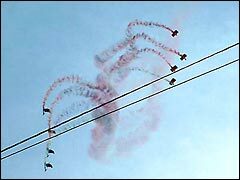 These plucky parachutists descending in formation were quite enthralling; this is the only shot we got of them as we ran out of memory having taken so many digital pictures at the Eastbourne Airbourne airshow! After they landed, we went to get a cool drink. 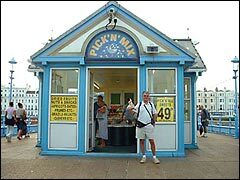 ...on to Eastbourne pier we visited the pick 'n' mix. There were airshow fireworks later at 10pm, but we didn't stay on for that or it would've been a very late night after a long day. Eastbourne Airborne airshow related websites are in our UK tourist resources. We've visited various military aircraft establishments at RAF Hendon, IWM Duxford and Fleet Air Arm Museum. 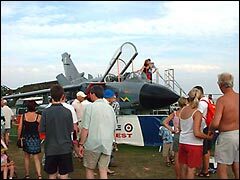 We also visited Airbourne in 2003 when the Red Arrows DID fly!